For those of you who follow me on facebook or twitter, you heard about my baking marathon last week. 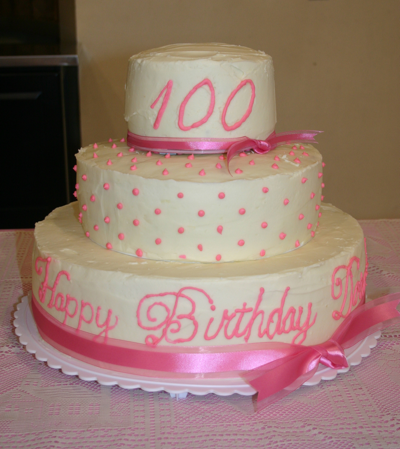 I was honored to make the birthday cake for a fine lady at my church who celebrates her 100th birthday today. We celebrated early on Saturday, but today is her official birthday so I thought it was appropriate to post this fantastic recipe today in honor of her birthday. Happy Birthday Dorothy! When I received the call asking if I would make the cake for the 100th birthday party, I was honored. At the same time, I told them I was not a cake decorator. They assured me that I would do a great job and they knew the cake would be delicious. I said “yes” to the project. I don’t think I really understood the enormous nature of the task. (That is not uncommon for me.) Fortunately, I always have friends and family who are able to lend a helping hand. So, Megan and Ashley, thank you! You really helped me stay on task and keep those cupcakes coming. Jeffrey, you were such a great encourager as well as the cake carrier. (Do you know how heavy a double layer of 14 inch cakes are?) All and all it was a great experience and one that I was honored to help honor a great lady. How many people do you know that make it to 100? 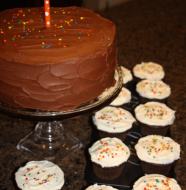 So onto the cake… This cake has become a favorite for dinner parties where I cater and folks frequently request it. More than that, it is definitely a favorite at our house. The combination of the spice in the cake with the smooth creamy frosting is out of this world. You simply will not find a better carrot cake recipe! Normally, when I cook something in extreme quantities (I made enough cake to make 9 regular cakes and shredded 13 pounds of carrots) I am sick of it well before it is out of my house. I can honestly say that I was enjoying the extras and was disappointed when we ran out of cake. It is that good. Beat cream cheese and butter together until they are smooth and without lumps. Add powdered sugar and vanilla and mix until well incorporated. You may need to scrape the bowl a couple of times to insure that everything is mixed well. Frost cake. Sprinkle pecans on top (if desired). 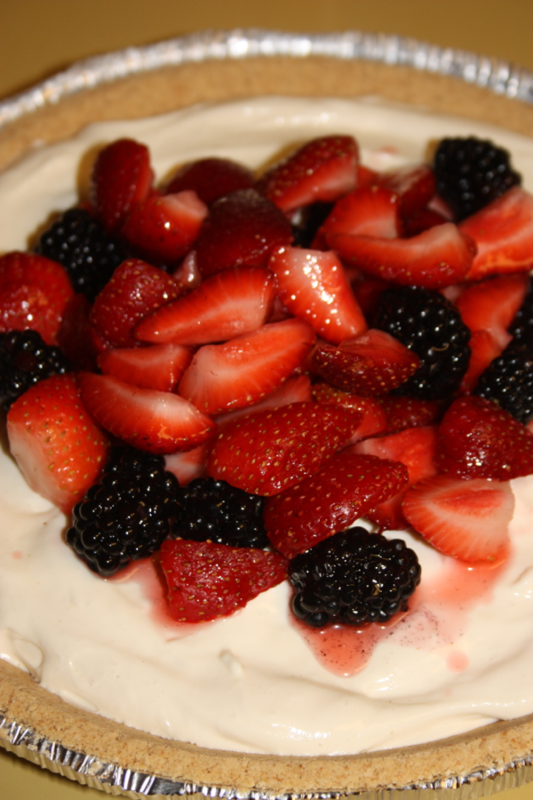 Recipe adapted from family friend Linda King. 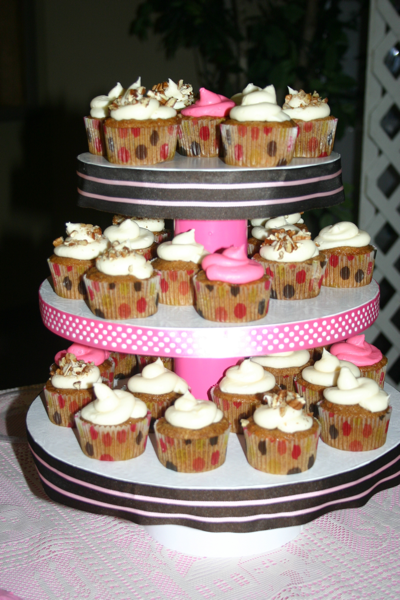 34 Comments on "Carrot Cake and a 100th Birthday"
I want to try one with pink icing. glad to meet you! i am subscribing, love the pics and recipes Im seeing just in my quick stop by during the cocktail chat! 100! That is so cool. Wow, that is an honor. Those cupcakes? Are making me salivate. 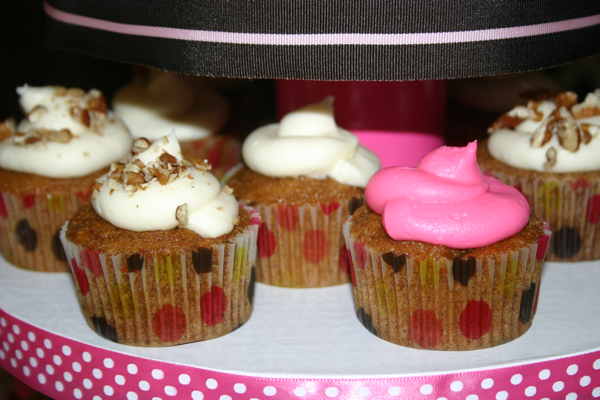 I love Carrot Cake so freaking much and those cupcakes look amazing! The big cake looks great too! Happy Birthday Dorothy! You have an amazing bunch of friends, lady! That cake is gorgeous and looks delicious!!! You did a great job!!! Here from Cocktail Hour. Have a great rest of the week! Yum!!! The cake looks beautiful, but the pink frosting cupcake is GORGEOUS! Wow that cake looks tremendous! I love to bake as well and will definitely taking this recipe for a spin. Thank you and your blog is so cute. I’m now following you on Twitter. OMG…I’m drooooling now! My mom loves carrot cake so I’m totally going to have to make these for her! Happy 100th to Dorothy…what an amazing life she’s lived I’m sure! Stopping by from the #Cocktail Party!!! Oops meant to say cake decorator…too much cocktail already! I’m definitely going to be trying this recipe! Visiting from the Sits Girls #cocktail comment hour! You are a woman after my own heart. I love carrot cake and cooking!! Can’t wait to try this recipe out. Visiting from SITS Girls Cocktail Hour! I may or may not have just licked my computer screen. My absolute favorite!!! It’s beautiful! YUM! I could totally go for one (or five) of those right now! Lol stopping by from the SITS cocktail party, great blog!! I’m totally singing “Someone’s in the kitchen with Dinah” over and over now.. haha! Wow! 100 years! I hope I’ll celebrate that birthday one day, especially if I get a cake like that! Beautiful. Carrot cake is my all-time favorite recipe. I agree with your reasons too. here from the SITS cocktail hour. Ohhh my lordy!!!! I love carrot cake… I wonder if i made this if it would turn out edible!!! I have to try! Looks Yummy!!! What a honor to have been asked to bake such an important cake and what a life she must have seen over the last 100 years. Happy Birthday Dorothy! This is me totally subscribing to your blog. I’m a whore for foodie blogs. Amazing cake… It looks delicioso! I’ll take two slices and a cupcake. Elizabeth from the twitter hour. I simply love carrot cake. Yummy! i will definitely try this recipe. Oh my goodness, I LOVE carrot cake. 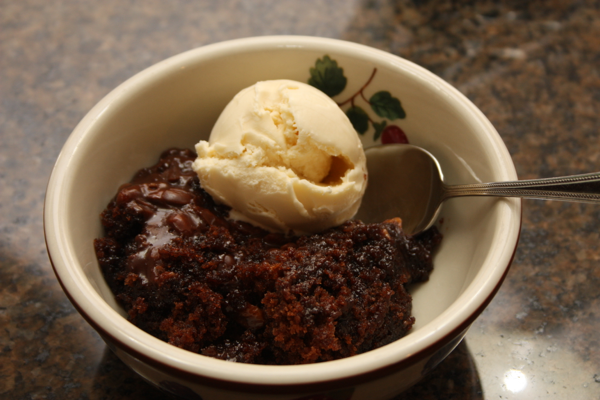 I am going to have to make this tomorrow. Yum! Carrot cake is awesome! These look delicious. Stopping by from SITS #cocktail chat. What a special occasion and honor this must have been! Visiting you from the SITS Cocktail Hour (just now getting to the commenting…). If you have a MOST POPULAR recipe post, I’d love for you to link it in our Star Recipes Collection…. just started this week so not many there yet but growing daily! Make a Food-“e”-Friend Monday parties when you can! As a girl with a coconut allergy, I’ve had far too many carrot cakes ruined by its inclusion. I’m so glad to see that your recipe is coconut-free! It looks delicious and I’m sure the birthday girl was very pleased. Dinah, once again you blow me away!! You are awesome!! Thank you Bonnie. Mom was a very special lady.